After the mushiness of the wedding episode that concluded Season Seven, I worried that the baby drama would submerge Season Eight’s opener. Happily, it manages to avoid those traps. Instead, it skirts around the melodrama and tosses out lots of quirky goodness. I especially like Ross’s continued romantic ineptness, especially when he screws up and gets stuck at the kiddie table. As I noted in my review of Season Seven, Friends came a long way since the early days in the way it treats soap opera bits. Over the first few years, it integrated them in a clumsy manner, but the later seasons managed to combine drama and comedy much more smoothly. We see that here with a consistently amusing episode that also manages to move along various plot elements. Although bickering Ross and Rachel usually sizzles, “Videotape” starts slowly. However, it picks up as it progresses, and the ending offers some amusing twists. Largely free of soap opera, “Date” doesn’t manage to go much of anywhere. The show includes occasional decent moments, but not enough to make it above average. It doesn’t suffer from any obvious defects; it’s just bland. “Party” gave me terrible déjà vu for last season’s episode where Ross’s son wants Santa and he dresses up like the Holiday Armadillo. Friends characters in goofy costumes doesn’t do much for me, especially when the show tries to get them to fight. Cox looks awfully hot in her Catwoman outfit, though, and it’s funny to watch Rachel not understand how to deal with kids. Despite that, this one is pretty average. Sean Penn didn’t fare well as the nice guy of the prior show, but he does better when we see his darker side here. Of course, we know this relationship won’t go anywhere due to his guest star status, but at least he adds some minor sparks. The better plot comes from Monica’s obsession with her maid. Psycho Monica always is fun, and this episode continues that trend. Non-confrontational Rachel is funny Rachel, and she shies away from conflict with the best of them here. Ron Leibman makes her avoidance all the more believable with his surly turn as her dad. The scene in which Ross tries to deal both with Rachel’s dad and his girlfriend is terrific. Many of Friends’ best episodes come from Thanksgiving. The high concept of casting Brad Pitt as a guy who hates Rachel seems a little cutesy, and the show never rivals the strongest holiday programs. Still, it builds to a wacky conclusion that satisfies. Friends doesn’t use Joey’s sisters with any form of consistency. They pop up almost at random just to serve various stories, and they don’t usually work effectively. The Sting subplot is odd enough to succeed, though, and “Boots” becomes reasonably amusing. Rachel’s rampaging hormones lead the way here. She flirts up a storm, which offers a lot of amusement. Ross’s dilemma also creates humor, mostly due to the weaselly way he tries to deal with relationship issues. As Joey and Rachel’s relationship deepens, the show gets sappier. Not terribly so, mind you, but enough to cause some awkwardness. Nonetheless, those parts exhibit moderate humor, which is good since the other two subplots don’t go much of anywhere. Is it just me, or did Chandler become the least interesting Friends character in the series’ later years? Maybe Perry’s various substance problems caused the show’s producers to shy away from him somewhat, or maybe Perry just lost his edge. Whatever the case, programs that spotlight him tend to flounder, and that happens with the high-concept tub issue. Add to that Joey’s dilemma and the episode fails to take flight. At least the Ross/Rachel naming battle adds some amusement. As Joey’s problems escalate, the show becomes goopier. It doesn’t help that we see Ross in serious Sensitive Guy mode, as he feels left out of the party. Watching Monica get orgasmic over Phoebe’s massage brings good humor to the program, though, and the secret of the closet certainly becomes intriguing. I’m not sure how much more I can take of Mopey Joey. The happy dog’s not the only one getting bummed out by the atypically sullen character. Ross provides a smidgen of humor due to his evasiveness, and the horrors of the video are entertaining, but Joey drags down much of the show. As one might expect, “Tells” takes a soggy turn due to a prevalence of soap opera elements. Yeah, but it’s inevitable, I suppose, if they want to move on the plot pieces. However, the subplot with Monica’s “soulmate” is pretty good; for once, Chandler gets a good role as he deals with his “competition”. As soon with the erratic turns from Sean Penn and Brad Pitt, guest stars can be hit or miss. Happily, Alec Baldwin provides a terrific performance as Phoebe’s excessively exuberant boyfriend. Along with other good moments like Monica’s attempts at a moving speech make this a fun show, and one thankfully free from most of the usual soap opera. Is there anything worse than a clip show? Yeah - searing abdominal pain, rabid monkeys… well, that’s about it. Some of the bits used to link the clips offer amusement, but it remains nothing more than a cheap montage episode. Another good guest turn pops up here with Marlo Thomas’s snooty and catty take on Rachel’s mother. The shower offers some good moments, but for the best pieces, we see the guys play “Bamboozled”. Those are arguably the funniest sequences of the year, as it’s absolutely hilarious to watch the characters play the nonsensical game show. ”Class” doesn’t excel in any of its stories, but it balances them well. Sometimes it’s better to have three good plots instead of one great one and a couple of lesser ones. This makes “Class” fun overall. An otherwise unexceptional program, “Late” earns points due to Grouchy Rachel. Aniston plays her in nasty mode so deliciously that she makes the episode good all on her own. After that, though, it’s a pretty flat show. Friends’ season-ending double episodes tend to be fairly broad affairs intended to please all of the people all of the time. That occurs here, with a show that tries too hard to be an Event. It’s got some funny moments but doesn’t gel overall, and the sappy cliffhanger ending doesn’t help. Although I didn’t care much for the year’s ending, I think Season Eight offered a generally consistent level of entertainment. Friends is the rare series that gets better as it goes. Season Eight is miles above the erratic entertainment of its first few years, and with only two seasons to go, it becomes less and less likely the show will ever falter. I look forward to those last two years, as Season Eight continues the series’ remarkable run. While previous seasons suffered from inconsistent definition, this set showed positive sharpness. Only a little lack of precision popped up during these episodes. Instead, the vast majority of the shows looked concise and tight. Some mild examples of jagged edges and shimmering popped up, and I noticed a bit of edge enhancement at times. The shows featured occasional examples of specks, but grain was the biggest issue. The programs looked unusually grainy much of the time, and that caused distractions. Unlike the often-muddy tones of prior shows, Season Eight offered pretty strong colors. Across the board, the programs were vivid and dynamic. Blacks seemed deep and dense, while low-light shots offered acceptable definition. The shadows were a bit thick at times, but they usually appeared good. Despite enough problems to knock down my picture grade to a “B”, I felt pleased with the look of Friends Season Eight; we’ve come a long way from the ugly visuals of the series’ early years. On the other hand, the remastered Dolby Digital 5.0 soundtrack of Friends remained extraordinarily consistent through all of the first eight seasons. As usual, the audio was fine but without much ambition. Given the talky nature of the series, though, this remained no surprise. Dialogue dominated the episodes and remained oriented toward the front center. As always, music presented solid stereo presence over the front speakers, and the surrounds echoed the tunes moderately. Surround usage was very modest and rarely made itself known. The back speakers essentially echoed the forward channels and did little else. This marked a slight regression after Season Seven, which featured a few examples of noticeable split-surround material. However, those were so infrequent that they barely counted, so I didn’t subtract any points for this year’s less ambitious mix. As usual, audio quality was fine but not spectacular. The lines seemed concise and fairly natural, and I noticed none of the light edginess that occasionally popped up in the past. Effects seemed acceptably accurate, but they never taxed the track at all. At least no problems occurred with those elements, and the music came across as pretty bright and bouncy. The rock-oriented score sounded clean and distinct, and bass response was tight and fairly rich. Season Eight sounded fine but it remained fairly average. Unsurprisingly, the supplements found on these DVDs seem similar to those on prior sets. Most show up on DVD Four, but we get a few bits on the others as well. As already noted, many of the episodes themselves include bonus footage. The amount of new material varies from show to show, and based on the running times, it appears that some of the shows include no extra footage. I don’t know Friends well enough to recognize most of the new shots, but I think it’s cool that we get the uncut programs. Three audio commentaries appear. 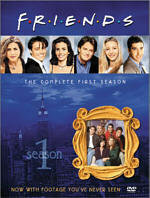 One appears on Disc One via “The One Where Rachel Tells Ross” and “The One with the Videotape”. The final commentary goes alongside DVD Four’s “The One Where Rachel Has a Baby”. We hear from executive producers Kevin S. Bright, Marta Kauffman, and David Crane. All the participants were recorded separately for these tracks, and the results were edited together. Some of the remarks related directly to on-screen activities, but many dealt with general issues. Folks who heard the prior commentaries will know what to expect here. The participants cover a mix of topics related to the series. We get some notes about the specific episodes themselves, and we also hear about general issues that deal with the show. There’s a little information about the impact of 9/11, and during “Baby”, Kauffman offers good notes about how her own pregnancy influenced the story. Overall, we get material that seems similar to prior tracks. The information occasionally seems useful and enlightening, but the participants go silent too often. That becomes a particular problem during “Baby”, which suffers from the most substantial gaps. The producers also tend to simply tell us how wonderful cast and crew were; Kauffman remains guilty of the most cheerleading. As in the past, the comments seem sporadically compelling but not consistently useful. Still, they include enough good material to warrant a screening. All four DVDs include Cast and Crew listings for the six main actors plus the three executive producers. These entries include no information about the folks; they simply list the names. Moving to DVD Four, Friends of Friends III presents another featurette focused on guest actors. In the 19-minute and 32-second piece, we hear from June Gable, Lauren Tom, David Arquette, Teri Garr, Bonnie Somerville and Debra Jo Rupp. They discuss their roles, working on the series, reactions to their characters, and attributes of the main cast. Much of this seems fairly bland and generic, and this becomes a pretty lackluster program. Expect the usual material from the Gag Reel. 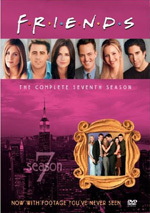 This eight-minute and 33-second compilation shows the standard goofs and giggles shot during Season Seven. It becomes pretty tedious and doesn’t offer much of interest. Hosted by actor James Michael Tyler, Gunther Spills the Beans offers a preview of Season Nine. This 115-second clip is literally just a teaser for the next DVD set. It provides nothing more than an ad. Next up is a quiz. Joey’s Game Show Challenge gives us a DVD version of “Bamboozled”. It combines multiple-choice questions about Season Eight episodes with game show gimmicks. It’s just as humorously unfair as the “real” contest and moderately fun to play. 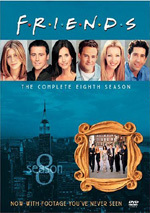 Once again, Friends presents a year with lots of entertainment via its Season Eight. We get good story development and much amusement in this fine set of programs. Picture quality improves over prior years, while audio remains about the same. The package comes with a roster of extras similar to those found in prior packages. I’ve recommended the previous releases, so I’ll definitely advise fans to give Season Eight a look.